It is an amazing feeling to put something out there that you've made and have people like it. At some level I've been doing this for years at WBC and online but it feels different to have people give up hard earned money instead of just their time and attention. Now it is time to acknowledge the actual hundreds of people who helped out in mostly chronological order. Know that I likely owe each of you more thanks than expressed here. 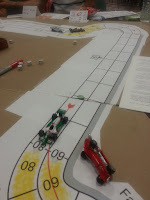 Thanks to Thomas M. Divoll and John B. Reilly who designed Speed Circuit forever ago. First published in 1973 by 3M, I hope that Speed Circuit is a proud parent of Championship Formula Racing and that Divoll and Reilly would be honored to have their creation continue more than 40 years later. Special thanks to Dad who taught me the game and later went to many an AvalonCon and WBC to play it and support it and provide his 2-cents on the revisions that became CFR. Thanks to Mom for playing many a 1-lap race around the old AH Monaco track with Dad and I. Thanks to Jim Fleckenstein The Elder for making me go to my first AvalonCon for work (true story) where I discovered that people outside my family played Speed Circuit. 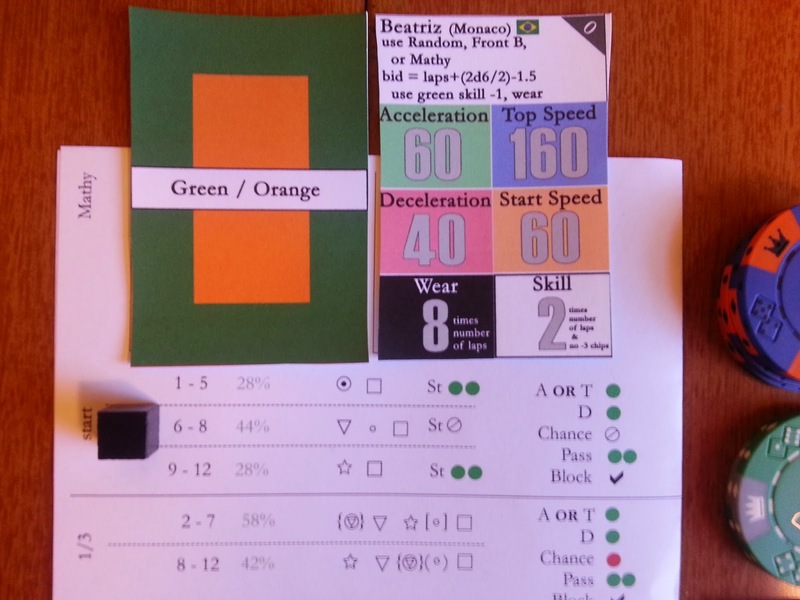 Thanks to Rob Cunningham who showed me that the game is best played with large fields and large cars and that there was a lot of space around the core mechanics to modify the rules. Thanks for Don Greenwood for managing the convention where CFR was birthed. Special thanks to the posse from my neck of the woods who have spent many many years supporting the game and helping me craft it. First among supporters and play-testers -- Mike Aubuchon, Jim Fleckenstein The Younger, Chris Long, and Tim Mossman. A big shout out to the guys who have helped expand the community around the game by running tournaments both in person and online: Chris Long took over stewarding duties from me many years ago at WBC; Fabio Pellegrino ran a PBeM for years and races in Italy and introduced the Italian contingent to CFR; Robert Rund ran two WBC PBeMs; Michael Polcen started a PBeM at Redscape a couple years ago; Kalvin Miller helps run the Redcsape leagues with Michael and also built The spreadsheet; Chris Brandt has been running a tournament at PrezCon for years; Tony LaMorte has been running another PBeM for years; Chris Hancock, Doug Galullo, Chris Brown, Randy Needham, and Jeff Harrington all stepped up to help me run my PBeM when it threatened to bury me. Crazy thanks to Jim Dietz who reached out to me unsolicited a couple years ago to see if I would make CFR for Jolly Roger games. I may have tripped over myself saying yes. Jim has been a great guy to work with through the early development process -- pushing for things that turned out great and willing to let go of things that did not. Also a shout out to Ginger Ludden who has made CFR look like a professionally designed game and not something I built in my basement and Colin Young who helped make the Kickstarter work. I am also amazingly lucky to have a family that supported me. Michael just recently decided to give CFR a try and loved it and was my wing-man for the Learn-To-Play videos of the game. Its been really neat to be able to play with my son a game my dad taught me. I can't thank Jodi enough. She put up with me disappearing every summer for years to go to WBC and stalking off to the office too many nights to work on rules or tracks the last year plus and was still the happiest for me when the Kickstarter funded. I'm lucky to share my life with her. Finally, because the list is really long, I have to thank all of the people who have played the game with me over the years. The Championship Formula Racing community is one of the best around. Many of you have offered suggestions and ideas that became part of the game, many of you probably funded the Kickstarter. All of you were hugely support even if all you did was play the game. Apologies to any I forgot. First a video of Michael and I running a quick 1-lap, 2-car race around the Mexico City track. We do a good bit of explaining to illustrate how Championship Formula Racing works. After a bit of a rough start, I give Michael a run for his money at the end. Next, a 2-video series explaining how the Historical Driver System works. Furthering my sister's theory that I am now famous... I'm on a podcast talking about Championship Formula Racing. Go take a listen and many thanks for the great people at Random Access Podcast. They were great, had good questions, and were very patient with me until I figured out that my computer mic was turned off. When Jim Dietz and I discussed the final form that Championship Formula Racing (CFR) would take, one item in particular stood out on Jim’s wish list - a way to race against the best drivers in history. The vision was to create a Historical Driver system where different drivers had different personalities, tendencies, and difficulty levels. It was important that the top historical drivers in the world would be hard to beat, not just rolling obstacles. I wasn’t sure how this would work when I started but this ended up as one of my favorite parts of CFR. The challenge forced me to consider some core concepts for creating Automated Opponents. Below I’ll share what I learned for any other game designers or tinkerers who might also want to go down this road. My first step in creating an Automated Opponent (AO) was to figure out what broad strategies I wanted each to pursue. Most hobby games have multiple paths to victory. Write down those paths and variations and note which are more popular than others. Don’t worry if some strategies are not as good as others. If people pursue a strategy, include it on your list. Having multiple strategies that an AO can follow allows you to have multiple AOs that end up doing different things. Some games are just better with a lot of players so the ability to have multiple diverse AOs can fill in that gap. If only a few AOs would ever be used at the same time, a variety of AOs will keep each use fresh. I like an automated system that makes me feel like I am playing against actual opponents. Real players have tendencies and goals. Making popular strategies better represented or more frequent in your AO design will keep the meta game consistent with or without AOs. In CFR broad strategies focus on how quickly to spend your resources. Spend them early for the early lead and try to hold on, save them for late in the race when everyone else running on bald tires, or spend them evenly throughout the race. I created variations on those three broad strategies for the AOs in CFR. However, the popularity of different strategies varies based on the track being used so I tweaked each AO to pick a different strategy based on the track. For example, James Hunt will use one of three different strategies: U (more of a mid to late game strategy), Mathy (more of a mid to early game strategy), or Front A (an early game strategy) -- typically in that order. But if the track is particularly suited to an early game strategy he reverses his order of preference. Most of the Historical Drivers in CFR do something similar. Now that we’ve identified the broad strategies that our AOs will pursue, we need to build a decision tree for each. For each strategy, figure out what their ideal play would be and rank all of their other options based on how that will help their strategy. As a general example, if an AO is pursuing a military strategy in a game, their first choice for an action on a turn could be to buy the largest sword, second choice might be to buy more armor, third choice… etc. You’ll probably figure out pretty quickly that there are variations on how an AO could pursue the same basic strategy. Maybe one flavor of military AO buys swords first, while another makes sure to balance swords with armor. Don’t forget set-up. Are there set-up options that might favor one strategy over another that individual players can choose? Stalking: uses some resources early to stay ahead of most cars, then tries to use resources evenly from then on. Set-up is also a big part of CFR. Certain car builds and pole bids lend themselves to different strategies. If you want to spend your resources early for an early lead, you might as well design a car with a high start speed and spend more on the pole bid to start at the front of the grid. Obviously there is a continuum to set-up options as well. A diversion into my theory on the three phases of game play, as illustrated by Ascension. This structure does not apply to all games but it does apply to a lot of medium to heavy weight modern board games. 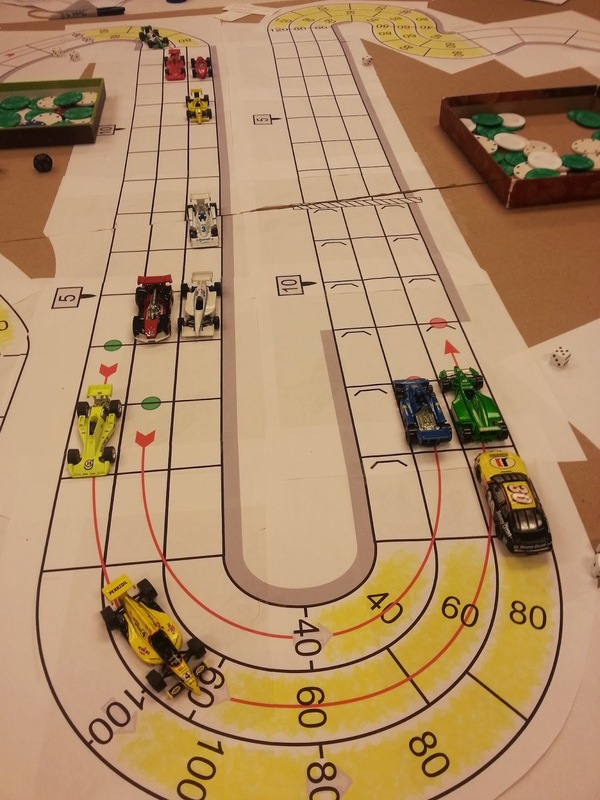 Many games can be split into three parts: Build the Engine, Run the Engine, Grab Points. Early in a game, you want to acquire the tools that you need to pursue your strategy. When I play Ascension, I spend the early game acquiring cards that let me best acquire more cards or kill off the junk cards I started with. Initially, I don’t care how many points cards are worth, and I don’t care how cool its special power is unless it gets me more cards or kills more junk. Once you have your tools, its time to augment that engine and run it. Twenty points into a sixty point game of Ascension, I switch over to buying cards that have synergy with what I’ve already acquired. I’ll pay a little more attention to point values now, but mostly I’m running my engine. I’m probably not continuing to acquire more ways to thin my deck. Near the end of the game, there are no long term consequences for your actions - it’s all about the short-term play that helps you win. In the last twenty points of a sixty point Ascension game, I no longer care if the card works with what else is in my deck, and I stop thinning out junk unless it’s harmless to do so. It’s all about acquiring maximum points. Now think about the game for which you are designing your AOs. Are there recognizable phases? How do you measure which phase you are in. Is it based on the progress of the game, or a player based metric? Should your AOs’ decision trees change based on the phase of the game? CFR strategies are all about how your tactics change over the course of the race. I developed two tools to trigger those phase changes. 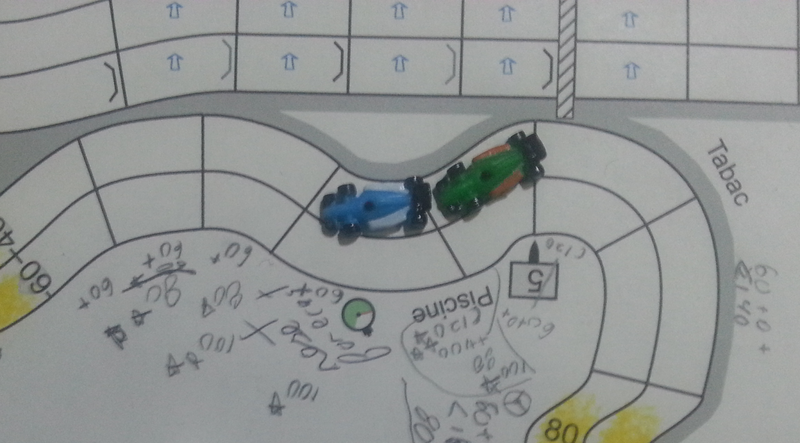 I split each lap into three sectors. No matter how many laps are being run, we can figure out if we are in the first, second, or last third of a race. Next to each corner I noted how many corners were left in the race. Corners are where resources are spent, so knowing how many corners is left compared to how much wear an AO has left is an alternate way to figure out what part of the race that strategy should be in. For most of the race my Even strategy will spend resources depending on if the car has more resources then the number of corners remaining. 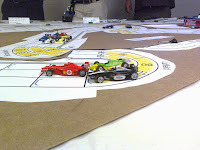 That way, the car spends resources pretty evenly through out the race. 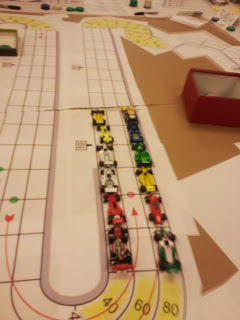 On the other hand, the Back S strategy will spend very few resources before the 2nd third of a race. If I know what the AO is going to do before the AO does it, that AO will be a lot less effective. This will be more or less true depending on the level of player interaction. If there is little player interaction, you might be able to skip this step. If there is a lot of player interaction, this step is crucial to creating a competitive AO. Randomness is your friend here. Each AO should have at least 2 things it might do on a given turn, or two ways it might do those things. This way, human opponents are not completely sure what it will do. Be careful not to resolve that randomness until you absolutely have to -- right before the AO needs to take an action or figure out if they will take an action. But don’t take the randomness too far unless that is the actual strategy. You want the choices an AO takes to make sense for its strategy. The choices may just be slight variations of each other. They probably should not be completely opposite. I made sure that each AO in CFR had a choice between at least two different decision trees during each phase of its strategy. Often this was just a reordering of choices or a slight variation. After every corner you roll dice to re-pick a decision tree for the next corner. On the right you can see a sample phase from CFR's Front A strategy. Each line is essentially a decision tree giving the car 2 to 4 different choices for how many resources to spend in the next corner. In turn this will determine the car's speed. The choices at the top direct the car to spend more then the ones further down until the stars indicate that those resources will only get spent if the use is particular efficient use. After all of this, your AOs are likely bad at the game and your decision trees are so complicated that it takes twice as long to take an AO turn as a real turn. Go back over your decision trees and simplify them. Then do it again. Pay particular attention to anything you had previously done to obfuscated or randomize AO actions. Does the obfuscation or randomization make it more time consuming to play an AO turn then a human turn? Now find ways to have your AO "cheat". Cheats can do three things: speed up AO play, make AOs harder opponents, and give AOs more character. For instance, consider some mechanics that might take a while to resolve. Having an AO always succeed at performing one or more types of actions will speed up play, make them better at the game, and reinforce their personalities and strategies. Having an AO "cheat" more or less will also make some AOs better than others. Originally, I obfuscated too much. The symbols I used in decision trees had little relationship to the choices they represented. I eventually switching to symbols that better represented the action desired, were easily remembered, and required less translation. Basic AOs in CFR are passable, but to create challenging AOs I added a number of "cheats." Many get bonuses during set-up. This is my main method for creating some AOs that are harder than others. A normal set-up in CFR uses 2 points to build a car. 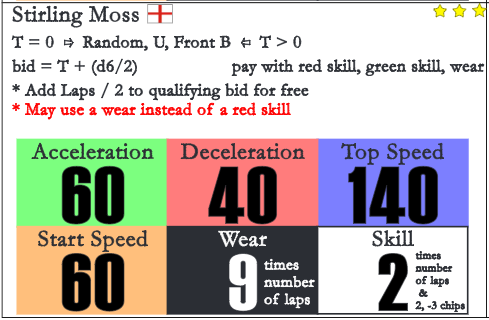 Stirling Moss' car, shown on the right, uses 4 points including some options (9 wear per lap) that are beyond what is normally available. All of the AOs in CFR can auto-pass certain die rolls during the game. This is mostly a time-saver, but also clearly gives them some advantages. Normally skill is used as a die roll modifier that helps drivers temporarily improve their car's performance. Historical Drivers use skill to automatically pass those same die rolls. Finally, many have special abilities or bonuses that reinforce their character and strategy but also give them advantages. Stirling Moss can effectively use 3 wear in a corner, which is illegal for anyone else. Look at your AOs. Are there parts of each that can be swapped into another similar AO to create something new? That’s a great way to generate a lot more AOs then you thought you had. For instance, maybe you built 3 AOs that are variations on a military strategy. Each has a slightly different set-up and slightly different decision trees. If you separate the set-ups from the decision trees and randomly recombine them before each game you now have 9 different AOs, where you used to have 3. Or maybe you find that you can split each AO’s decision tree into 3 parts. Now you have 3 early game decision trees, 3 mid game decision trees, and 3 late game decision trees for each military AO creating even more variety and obfuscation. 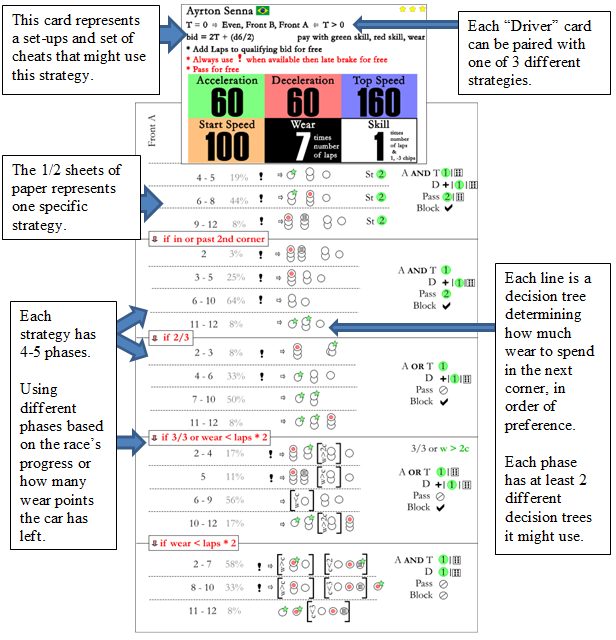 In CFR I created 10 different decision trees (strategies) and 24 different set-ups (drivers) that come with in-game "cheats." Each set-up uses one of three different decision trees. This went through many changes during testing. Originally, I had 12 generic strategies that were married to particular set-ups. Then I separated set-ups from strategies and was able to reduce both the number of strategies and set-ups but still retained a lot of variety. The most important part of designing AOs is the same as all game design: testing. Very few games come with Automated Opponents. So there is a lot of space to practice using the games already on your shelf. I’ve started designing AOs for one of my son’s and my old favorites, Valley of the Mammoths. I’ll share the results of that project when I’m done. Below is what I ended up with for CFR (development, not final version). 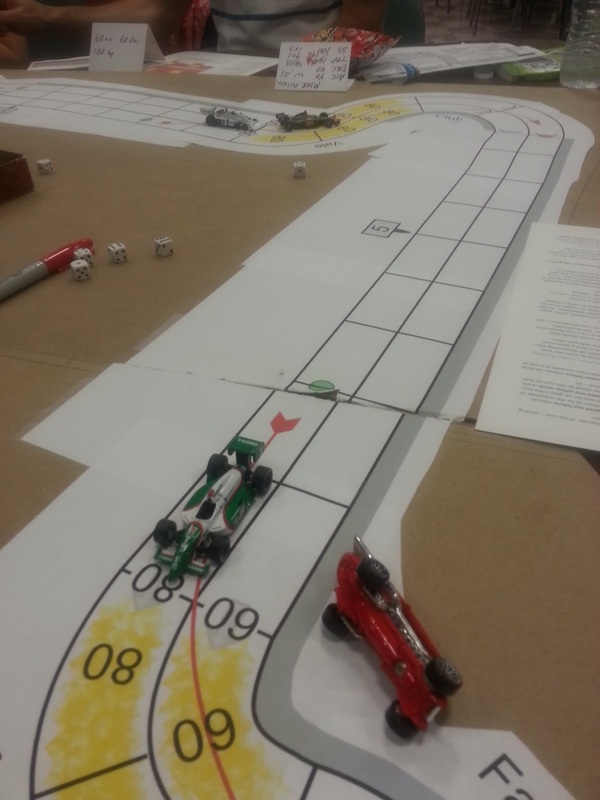 The largest in-person Championship Formula Racing tournament. The birth place of the game. The room where the years and years of play testing happened. The World Boardgaming Championships are less then 2 months away so here are the details. After a lot of debate about the start speed test table, I made a slight change. The idea is to prevent stalls from feeling like they end a driver's race after the first turn. First, the odds of a mis-shift increased at the expense of the odds of a stall. Second, stalls no longer result in damage to the car and are now treated like a spin for all purposes. For those of you who kickstarted CFR, we may have actual production copies of some of the individual components there.